A field on the east side of Buena Vista Road near the Polk-Benton County line. 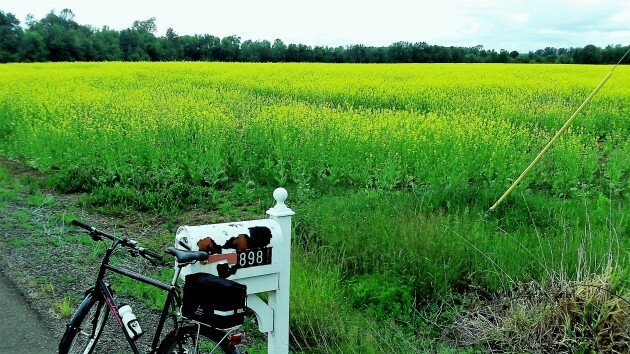 Regardless of what this is, whether mustard or turnip seed or something else, it’s always a welcome sight when I’m riding my bike on the back roads of the mid-valley in the spring. Stretching from the road to the horizon, these expanses of green and yellow make springtime in the valley an especially colorful occasion. The growers don’t grow this stuff to make the countryside place look pretty, but it’s a nice side benefit that this is the result. What does it have to do with anything in the here and now? Not a whole lot, really, except for this: If national politics drives you up the wall, if you’re beginning to think the presidential campaign may be the beginning of the end, take a drive out into the country and look around. It won’t change your mind about the state of public affairs, but it will likely calm you down. And so, here’s another look. Yes, striking and beautiful. As long as the pollen in the air doesn’t make you sneeze your head off or dig at your itching, bloodshot eyes. All calm here. Speaking of politics, I caught a glimpse of a funny bumper sticker. It simply read “Obama 2016 – Just to piss you off”. Sorry for the language displayed there all but given our choices it actually reads pretty darn good. Having the opportunity to slow down and look around is a wonderful thing. My wife is from western Idaho and we usually travel highway 20 through the high desert to get there. As the driver, I didn’t see the antelope along the way until the basic speed rule was replaced with the “fuel efficiency” speed limit of 55 mph. 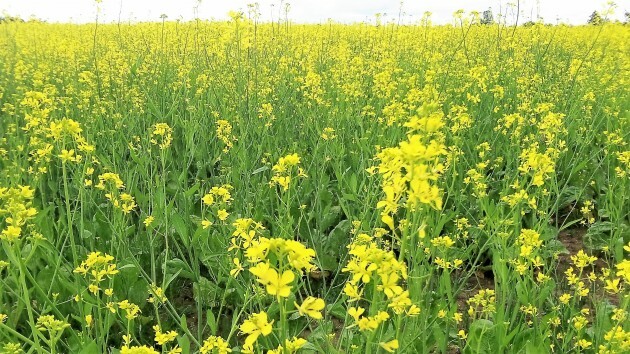 When I am traveling the county roads, as a farmer, my gaze is usually narrow, looking at the fields for weeds and diseases or other problems. It is only when I stop and turn my stiffening neck for a panoramic view that I realize what a beautiful valley we live in. I usually suggest May and June as the best months to potential visitors. In the last 70 odd years I have seen our farm go through almost a full circle of crops. In the forties, we were subsistance farmers and diversified with livestock, grains and grass for seed. When I returned from college and military to the family farm, we were on a specializing track. By the mid 90s we were, for a brief time, 100 % grass seed production. Now we are diversifying again. The first, non-grass (and wheat, oats and barley are grasses) we raised was clover. And then came meadowfoam, and turnips, and radish and flax and mustard. And now filberts, err, hazelnuts, are in our immediate future. Diversity is good for the soil, it is good for economic risk control. And it is good when one is standing at a viewpoint and gazing at the beauty of agriculture in this valley. I hope we all have an opportunity to slow down and appreciate this place. Thank you to Mr. Pugh for growing all the marvelous crops over the years that we here in the Willamette Valley enjoy. Being a farmer is hard, relentless work, no matter the crop. Just today I have a box of beautiful strawberries from the Farmer’s Market in Albany, grown in Lebanon. And while I’m in a thank you mode, kudos to Hasso Hering for sharing all his insights and travels here on HH-today. I read all of it, even when I don’t comment.